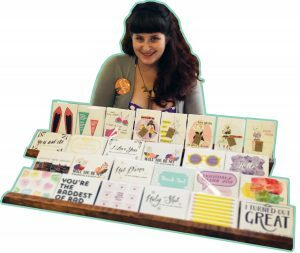 Fox & Fancy was originally founded in 2012 by two crafty gal pals. Some of our first customers will remember when Fox & Fancy was just a small 8-piece leather jewellery collection and some floral cupcake flags! Over the years we’ve evolved and changed and today you can find Rachel's 100+ stationery designs in stores, subscription boxes, and at local craft and trade shows, or commission her to create beautiful bespoke stationery and wedding designs. Want to know more? Read more about our back story in our feature story in Sad Mag, or see what we’ve been up to lately on instagram! Think Fox & Fancy would be a good fit for your store, subscription box, or something else? We'd love to show you our wholesale catalogues; contact us via our Wholesale Information page and we’ll be in touch shortly. We’re so excited to work with you to design your dream invitations and day-of wedding stationery! To get started, please fill in our wedding questionnaire form, and we’ll get back to you to set up a complimentary consultation. All of our stationery is printed locally in Vancouver BC on FSC-certified stock. You can shop our full line in our online store, on Etsy, or at your favourite local craft show! Didn't you used to sell jewellery? It's true, we did! While we no longer sell our designs on a large scale basis, we still have some pieces available for retail and wholesale. Simply send us a note with what you're looking for, and we'll see what we can do. In addition to all our stationery and wedding designs, Rachel also designs websites, logos and branding, plus a whole bunch of other stuff. Feel free to get in touch if you're interested in her design services!